For Sale All Locations, South Carolina, Florence E. Palmetto St. & Freedom Blvd. 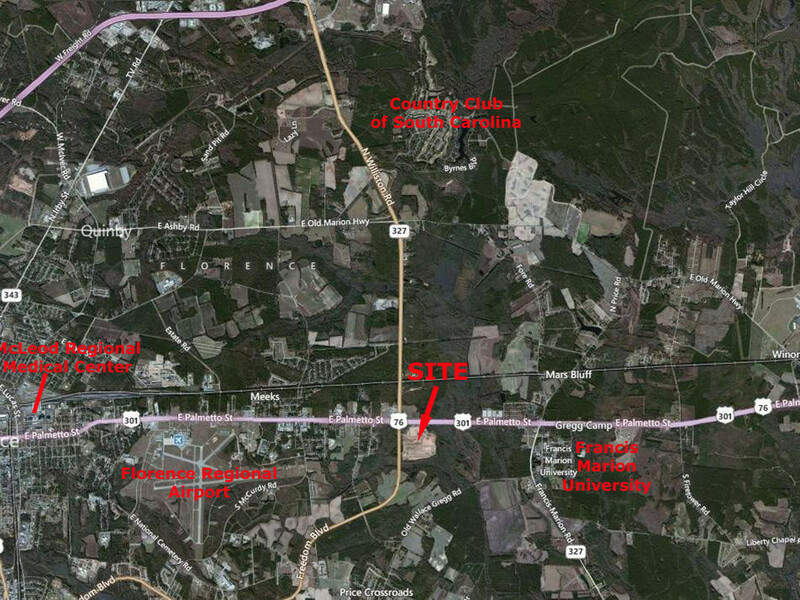 Sandstone Plaza is a +/-152.17 acre mixed use development strategically located at the intersection of US Hwy 76/301, the highly traveled tourist corridor with +/- 30,100 VPD to Myrtle Beach, and SC 327/Freedom Blvd, the newly built bypass from US 52 around South & East Florence to I-95. Infrastructure is completed with retail, office and service oriented parcels on the northern portion of the development and 150 single family residential lots on the south. All roadways are curbed and common retention areas are provided for the entire development. Approximately 1 mile from Francis Marion University, 2 miles from the Florence Regional Airport, 5 miles from Interstate 95, 4 miles from McLeod Regional Medical Center and less than 5 minutes from downtown Florence. This development provides great sites for shopping centers, stand-alone retail, office, light industrial, multi-family and single-family uses.